If I use it continously with my GPS, it will last for only 3 to 4 hours, after a full charge. Similar situation applies to almost all of the new models of PDAs. It is especially bad for models such as NZ90 @ “The Brick”, it will need a recharge after taking about 10 pictures!!!! Therefore the need to have a charger around you at all times became necessary especially if you are a hard-core user such as myself. For the past 2 years, I’ve collected a variety of travel chargers and I decided to do a little test. Yep, I know it’s a bit late already since I should’ve done it 2 years back when I initially acquired them. But better late than never! At least others can benefit from my own (expensive!) experience. PEGA-HS10 Plug Adapter – allows HotSync using a USB2.0 cable and charging using the supplied AC adapter. CLIE T-series Travel Charger – allows charging from any AC point since it supports AC100v – AC240v. 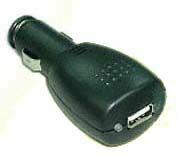 Car USB adapter (5.5v model) – CUSB – allows charging from a car cigarette lighter power socket. In the above picture, it is seen together with Sony Clie T/NR series USB cable. Let us discuss this chronologically, starting with the first item that I bought which was the T-series Travel Charger, followed by the Car USB adapter and lastly the PEGA-HS10 Plug Adapter. I bought this item 2 years ago from Brando. Nothing much to tell except that it does what its supposed to do, which is to charge my PDA. I did learn not to switch my PDA on while it is being charged since I may end up with a corrupted display. As long as I don’t do anything rash, everything will turn back to normal after it finished charging. If I panicked and start pressing buttons, I’ll end up with a hard reset, this is something that you don’t want to happen to your PDA on a regular basis. Today I tried to measure it’s output voltage. After wasting an hour trying to do so, I gave up. Apparently it had built-in safety protection so that it wont start charging unless there is something to be charged i.e. my PDA. I guess I have to take it’s word for it that it’s output is 5 volts DC at 5 amperes. For those who wants to try, the neutral is at pin 2 and the live current is at pin 12. 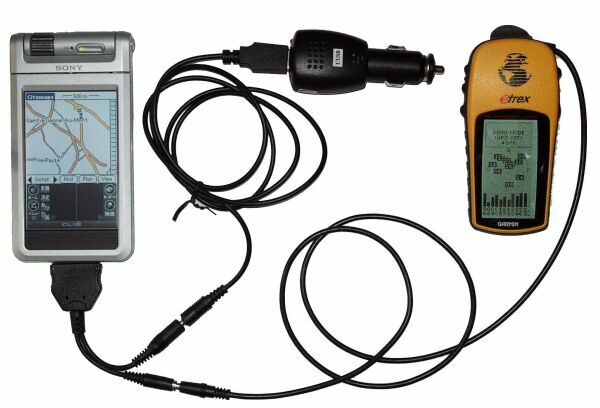 This is something that I acquired to overcame the problem of my PDA running out of juice while using my GPS and related apps in the car. I bought it from PC-Mobile. According to it’s website, CUSB is specially made to output 5.5v, and averaging 750mA, therefore my PDA can be charged satisfactorily and safely. It also claims that the actual output voltage and current is affected by input (cigar lighter) and the devices it is attached to but will be in the range of 5.5v – 5.8v and 600mA-900mA. Caution: DO NOT connect the car adapter and PDA THEN turn on the car ignition. While this may be OK with most cars, some car may not have enough safety precautions in the wiring of the cigar socket (?DIY). When the ignition is turn on, there may be sudden surge of voltage/current which may damage anything connected to the cigar power (though the car adapter itself has a fuse). We would advise disconnecting the car adapter after the ignition is turned off as a habit. This is the same common sense as in the home – turn all electrical appliances off before you turn the mains on after a power cut/failure. I’ve been using this for a while since January 2003. Surprisingly my PDA’s motherboard was fried by ?high voltage while using it sometime in May 2003. I sent it in for repairs and I had to pay RM544 for repairs done. The same thing happened to me again last Saturday. The technician at Sony informs me that it is due to incorrect voltage of the charger. I decided to do a little test and connected my multimeter to the CUSB while driving from Sony Bandar Utama back to my office. To my shock and surprise, it was registering a voltage between 12 to 13.8 volts. No wonder the motherboard was fried TWICE! Don’t believe me, look at the picture below. This was taken when I was stuck at the traffic jam near PWTC. Conclusion – don’t trust the advertisment. Check it out yourself or you may end up footing a big repair bill such as the one that I had to pay! The above item comes together with the CUSB. I decided to check it out whether it is safe to use it. I tried it with the USB port of my notebook. I am glad to report that the USB cable is safe to use to charge the PDA since the voltage is only 5 volts and is quite stable. Hurray! The plug came with my new NX-80V. I could easily hotsync using it with a USB 2.0 cable. I could also charge my PDA when I connect the plug adapter with the supplied AC adapter. Since the AC adapter is supplied by Sony, I am glad to say that it is of the correct voltage, therefore safe to use. Be wise. Check the output voltage of such items before using them. Otherwise you may regret it ……sob..sob..sob.